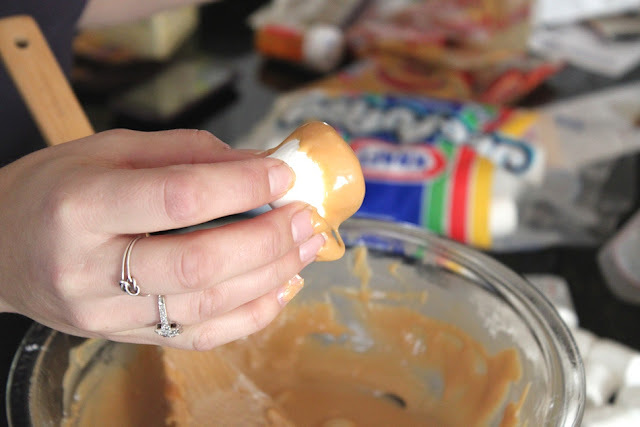 I've been lucky enough to have my parents visiting for a week, so of course I demanded that my mom jump into the kitchen with me to make Christmas candies :) How could I pass up the chance to soak up some of her wisdom and snap a few photos to share? 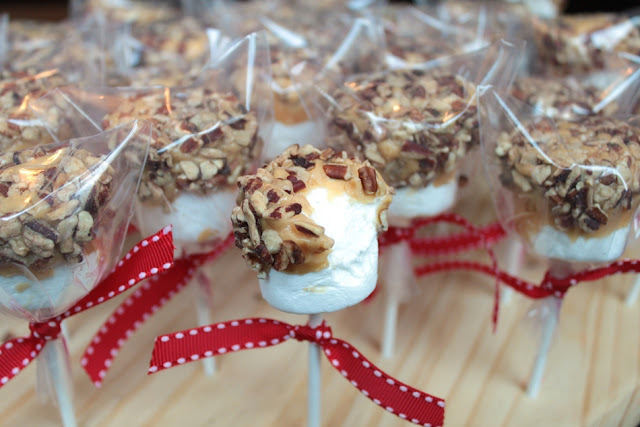 These little pops are a twist on a candy my mom has made since before I was born. 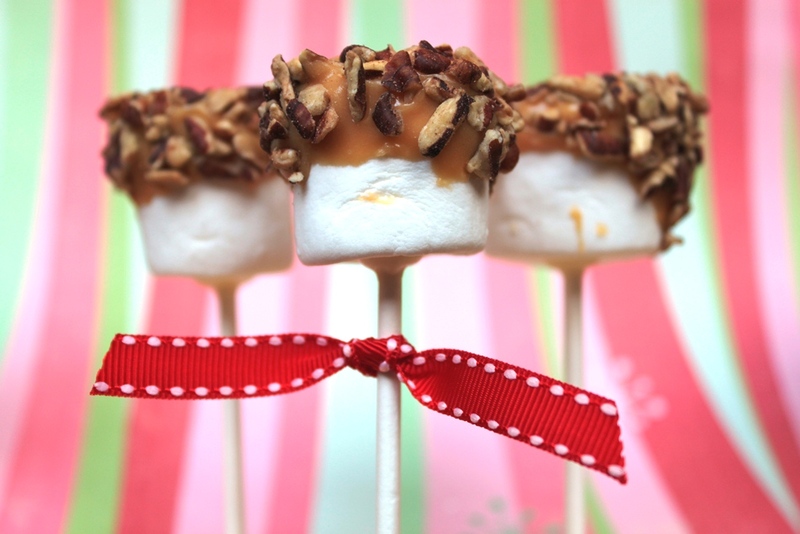 She makes this candy in a log roll shape, but we thought it would be cute on a stick. 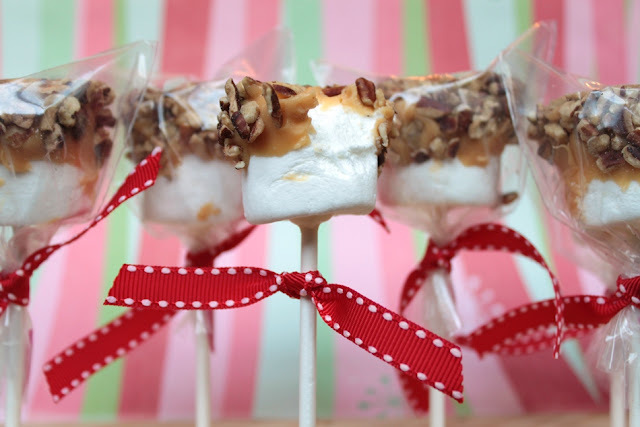 Because sticks and ribbons make everything cute, am I right? Right. 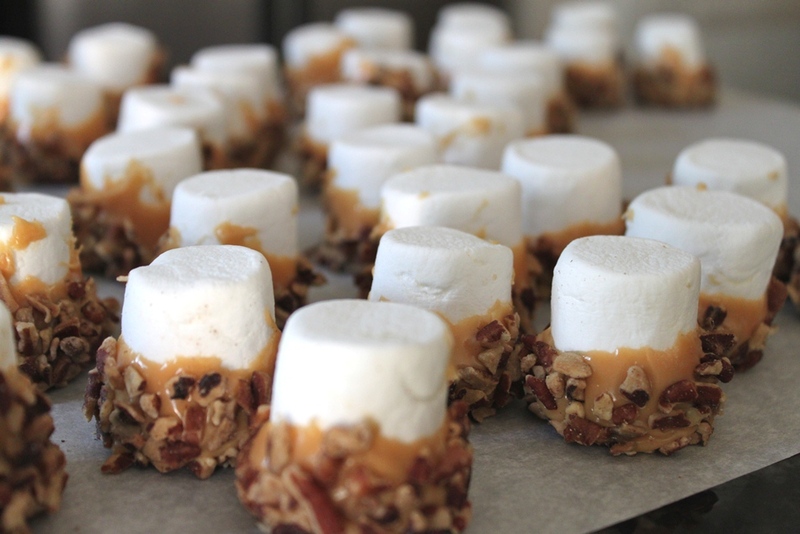 Plus, making them in individual portions makes it easier to share as gifts. 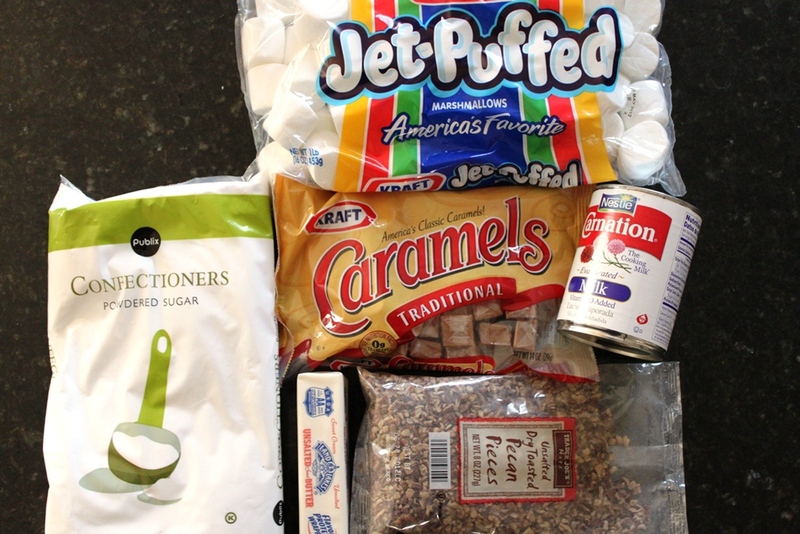 Later this week, I'll be posting our adventures making marshmallows from scratch (totally messy, totally fun)! 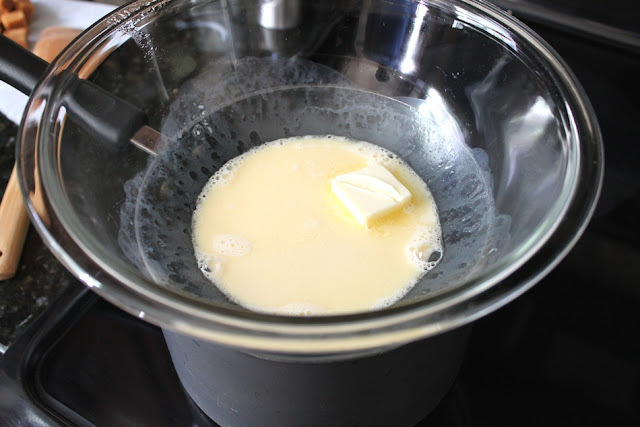 In a double boiler over a medium boil, melt the butter with the evaporated milk. 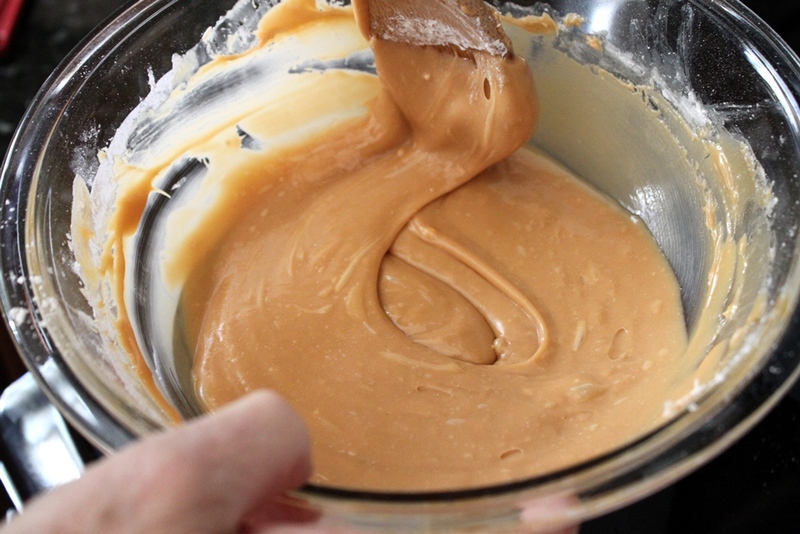 Add caramels and melt until smooth, stirring often. 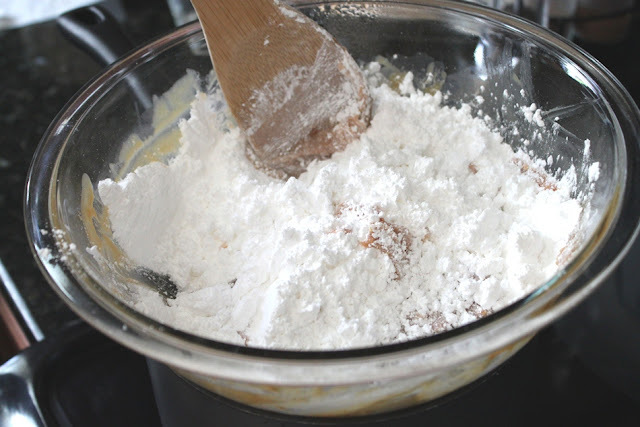 Stir in powdered sugar and stir until smooth. 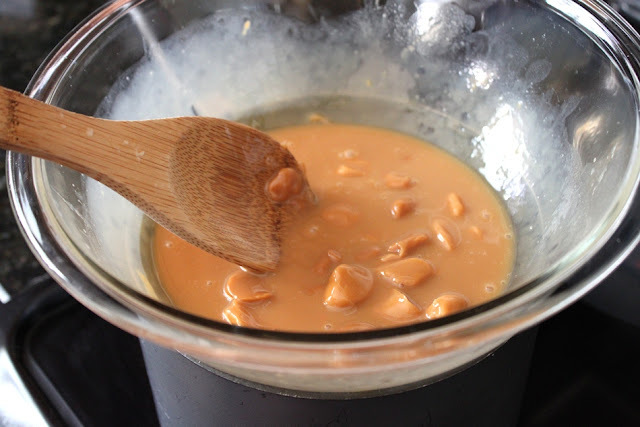 Remove from heat and dip marshmallows into caramel and then roll in chopped nuts. 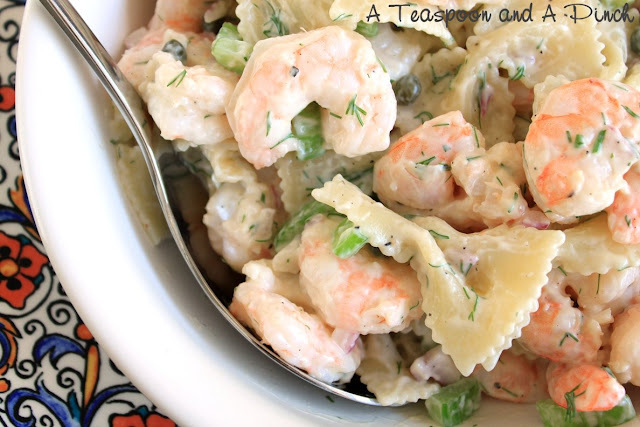 Allow to cool and set on parchment or wax paper. 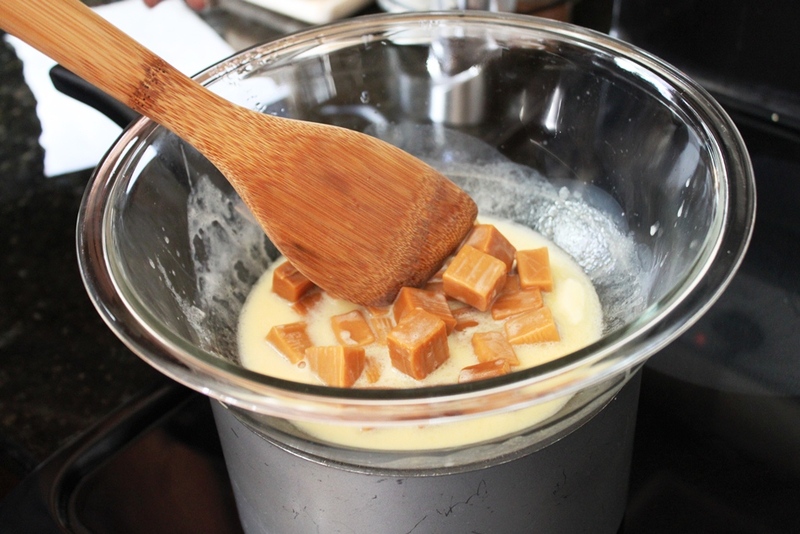 Melt white chocolate in the microwave at 50% power, stirring every 30 seconds. Dip end of sticks into melted chocolate and poke into marshmallows. Allow chocolate to cool and harden before handling. Store in an airtight container or wrap in individual bags with ribbon. * Note: Sift the powdered sugar before measuring. In a double boiler, melt butter with evaporated milk. And melt, stirring often, until smooth. 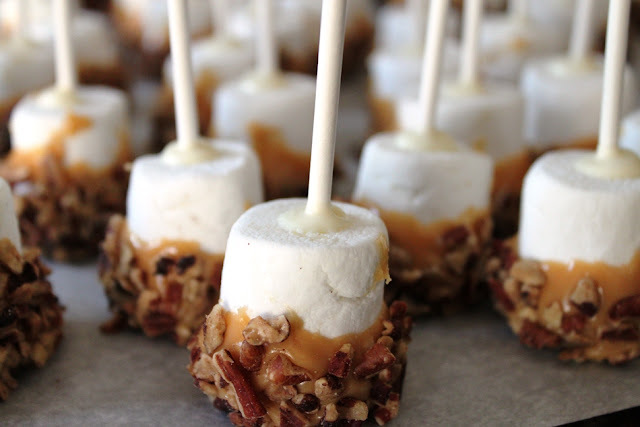 Hold each marshmallow by the edges, and dip into the caramel. Stir caramel often so that it doesn't become too thick to easily dip the marshmallows. 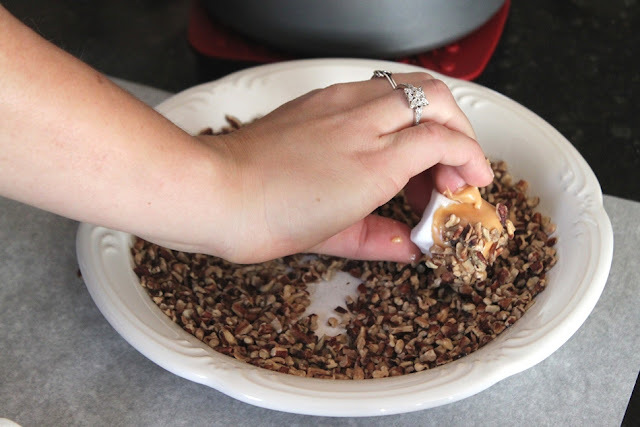 Roll the dipped edge in chopped pecans or peanuts. 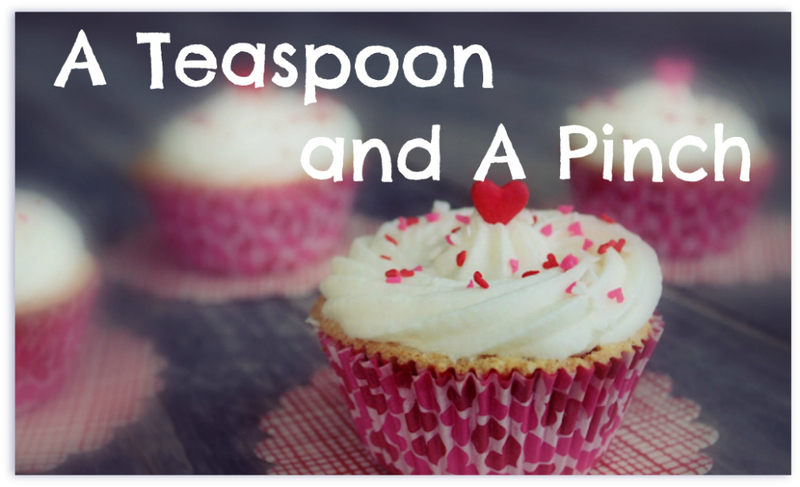 Allow to cool on parchment or wax paper. 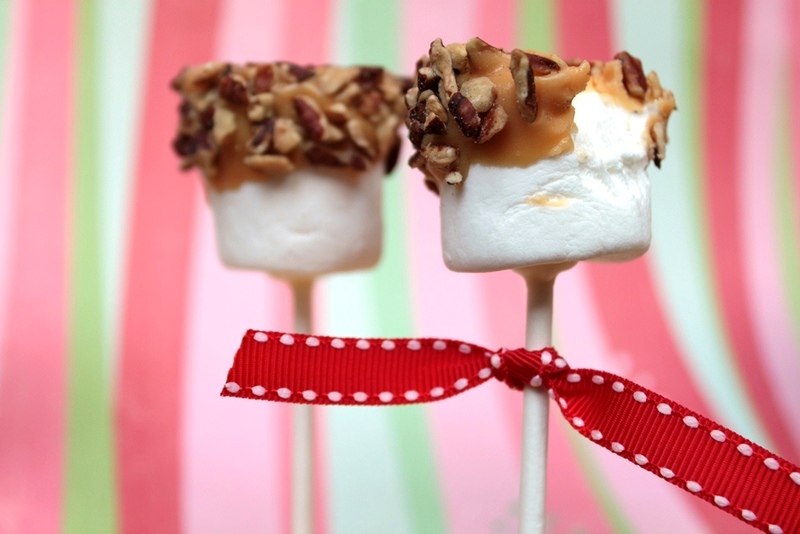 and poke into each marshmallow. 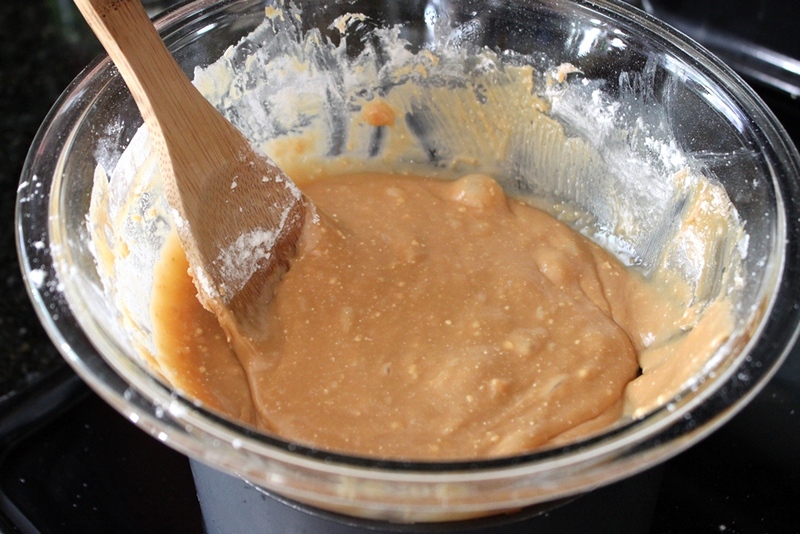 Once cooled, bag and tie off with ribbon. Who am I to argue with such an absolute assertion like "sticks and ribbons make everything cute". That was pretty funny. Glad you could have some quality Holiday kitchen time with your Mom.